Content - ADJ Profile Panel RGBA: ADJ’s Best Selling Wash Panel Just Got Better! ADJ Profile Panel RGBA: ADJ’s Best Selling Wash Panel Just Got Better! The original Profile Panel RGB has been one of ADJ’s best-selling products for almost an entire decade. 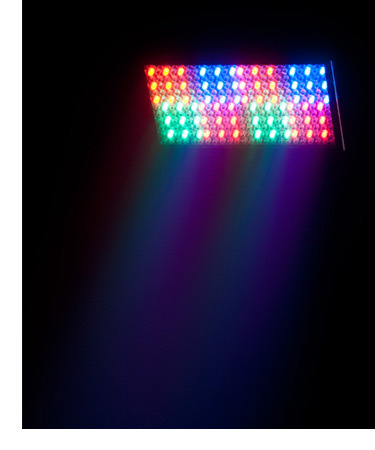 Combining an array of low-power LEDs with a flexible casing design and an affordable price tag, the fixture has proved popular for all kinds of stage, dancefloor and décor lighting applications. However, here at ADJ we are committed to continually improving our product range, which is why we are now pleased to introduce the new and improved Profile Panel RGBA. Building on the success of the original, the new Profile Panel RGBA offers a host of enhancements and new features that make it ideal if you’re looking for a versatile wash lighting fixture. It offers brighter LEDs, enhanced color mixing, improved power connectivity and IR wireless control, while retaining the slimline case design and flexible hanging bracket of its predecessor. Offering significantly increased brightness, the Profile Panel RGBA features 288 10mm LEDs, in place of the 5mm LEDs that were utilized by the original fixture. 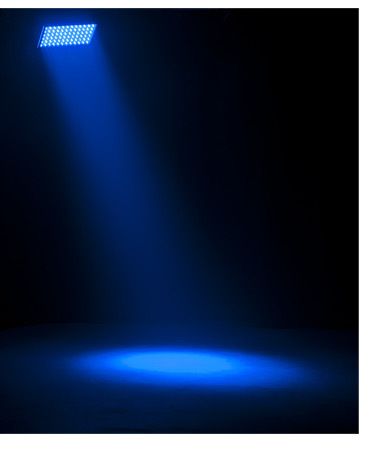 This creates a powerful wash of light with a 30-degree beam angle that is perfect if you have architectural features to illuminate, a dancefloor to fill, or a stage to flood with light. And, with a rating of 100,000 hours, lamp replacement truly is a thing of the past! As the name implies, the new model also features the addition of amber LEDs alongside the red, green and blue light-sources that were utilized by the original. This allows for increased color mixing potential, meaning that vibrant warm hues can be created which are particularly useful for stage lighting. The unit is supplied pre-programmed with 47 macros, which allow for easy programming and color selection, while full RGBA mixing can be used to select from a huge gamut of possible colors. Just like the original Profile Panel RGB, the LEDs on the new model are arranged into eight separate zones, which means that the fixture can be used to generate dazzling eye-candy effects are well as uniform color washes. The new fixture also features a useful slot that allows the introduction of a Light Shaping Filter to widen the beam angle to produce a far-reaching wash if you need it (filter not included). Another key upgrade to the Profile Panel RGBA is the introduction of professional-standard powerCon input and output sockets. These mean that the power supply for multiple fixtures can be linked together (up to 20 at 120V) making for quicker setup and breakdown times as well as neater rigs. Thanks to the pro-grade connectors, power cords also lock securely into place preventing them from being accidentally disconnected. For ease of operation, the Profile Panel RGBA is also provided as standard with a UC IR infrared wireless remote which can be used to select specific colors as well as access and control the unit’s internal color chase patterns. Alternatively, the fixture is also supplied with an Airstream IR transmitter which can be connected to the headphone jack socket of an iOS device to allow control directly from ADJ’s free-to-download Airstream IR iOS app. The flexible Profile Panel RGBA offers a choice of 6 operational modes: built-in programs, sound, static color, auto run, RGBA dimmer and DMX. A four-digit LED display, together with four selection buttons, allows easy selection between the modes as well as other options such as chase speed and DMX address. 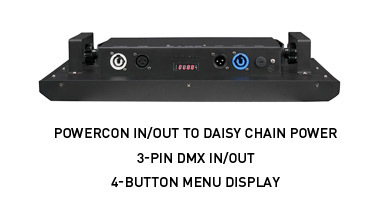 For DMX control, 4 different channel mode options are available – 4, 7, 9 or 32 – which means that you can choose the right combination of channel usage and level of control to match with your particular needs. As with its predecessor, the Profile Panel RGBA is fitted with a sturdy dual scissor yoke. This can be used either to attach the fixture to a lighting rig – hanging in any orientation – or stand it directly on the ground pointing upwards for wall-washing or to serve as a stage footlight. With a sleek and robust all-black metal housing, the Profile Panel RGBA will look at home as part of any temporary lighting rig or fixed installation. It’s slimline design also means that it is easy to transport and rig with compact external dimensions (16.73” x 3.2” x 10.75” / 425 x 82 x 275mm LxWxH) and a low weight (7.8 lbs. / 3.5 kgs.). Offering a winning combination of features, flexibility and affordability, the new ADJ Profile Panel RGBA is the ideal fixture for any situation where you require a wash panel. Whether you’re a lighting designer, equipment installer or mobile entertainer, this compact panel offers the brightness and color mixing potential to fill any stage, dancefloor or event space with vibrant light washes or eye-catching chase effects. The Profile Panel RGBA is available now from your local ADJ retailer.